Art Classes: Norwegian Folk Painting, Acrylic Painting, Beginning and Intermediate Oil Painting, Watercolor and Rosemaling. Call The Center at 218-829-9345 for information or for the instructor’s information. You will find that you are artistic, you just needed a great instructor! AARP Smart Driving Classes: You can sign up to take AARP Smart Driving Classes at The Center. We offer the beginning 8-hour class and the 4-hour refresher class. Call for dates and times. You MUST complete an Introductory Class before taking a Refresher Class. The cost is $15 for AARP Members and $20 for Non-AARP Members. Call The Center at 218-829-9345 to sign up. Chess: You could be learning to play Chess at The Center. If you play Chess or wish to learn to play Chess, please contact Cleon Sundby at 612-384-2670. He would like to start a Chess group. 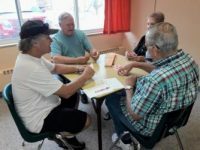 Cribbage: A group plays Monday from 1:15 – 3:30 pm. If you want to learn, come early and they will teach you. Lakes Area Great Decisions: The Lakes Area Great Decisions Group meets the 3rd Monday at 4 pm from April through November. 2019 topics will be announced soon. Contact The Center at 218-829-9345 for information or check in the monthly newsletter. You may also contact Jon Strand @218-454-1025 or email jonstrand@brainerd.net for more information.